CBSE has announced the CBSE class 12th result 2018 on May 26 at 12.30 pm. The students can check their result using their roll number, school number, and center number. The passing percentage this year has increased to 83.01% as compared to last year’s 82.02%. The CBSE 12th result is out all for all streams i.e. Science, Commerce, and Humanities. The result provides subject-wise marks scored by candidates in the CBSE administered All India Senior School Certificate Examination (AISSCE). This year, Class 12th exams were conducted between March 5 and April 13, 2018. Approximately, 11,86,306 students appeared for the exam. 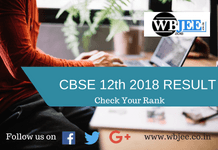 To know more about the CBSE 12th result 2018 including steps to check it and the link to view and download the result, read the complete article. CBSE 12th Result in the form of a rank card will appear on the screen. Check the details mentioned over CBSE 12th Result and download it. Take a print out of CBSE 12th Result and preserve it. How to check CGPA yourself? Students are advised to collect their mark sheets or scorecards and Class 12 passing certificates from their respective schools. These documents are important and should be kept safe for future. Students will be required to attach the copies of these documents in whichever college or university they apply for graduation.